Illustration provided by Coleen Martin. The Delmar T. Oviatt Library at California State University, Northridge and a group of CSUN journalism students will be celebrating the taboo, the forbidden — and the frequently banned. 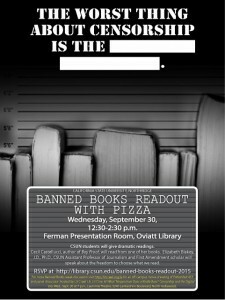 The university’s second-annual Banned Books Readout, hosted by the Oviatt, will be held from 12:30 to 2:30 p.m. on Wednesday, Sept. 30, in the Ferman Presentation Room in the library. Students will read aloud excerpts of books from the American Library Association’s 2014 top 10 most-challenged literature list, which includes works such as “And Tango Makes Three” by Peter Pernell and Justin Richardson, “The Perks of Being a Wallflower” by Stephen Chbosky and “The Kite Runner” by Khaled Hosseini. Other traditionally challenged books, such as F. Scott Fitzgerald’s “The Great Gatsby” and Ray Bradbury’s “Fahrenheit 451,” also will be spotlighted and read aloud. Coleen Martin, coordinator of the library’s outreach services, said she is looking forward to this year’s readout, as it will include a discussion with young adult author Cecil Castellucci (“Boy Proof”) and more than a dozen journalism students studying freedom of speech and the First Amendment, led by CSUN journalism professor Elizabeth Blakey. Martin explained that this year’s readout would be the first with a journalistic component. The event is free and open to the public. Complimentary pizza will also be available. 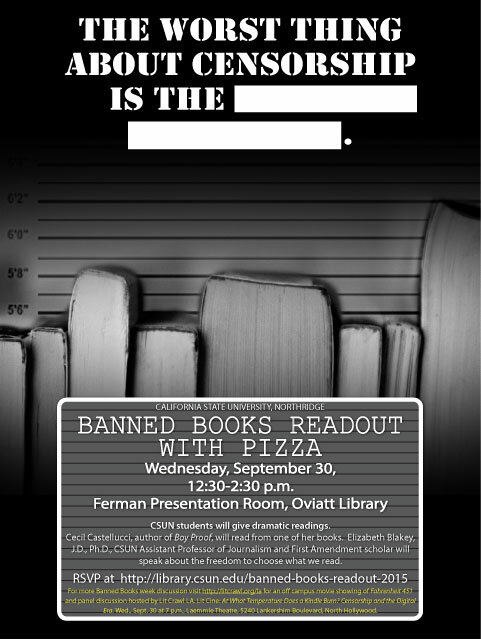 To register to attend the event, please visit http://library.csun.edu/banned-books-readout-2015 or call (818) 677-2638.